Kawasaki revolutionalized the big-bore sportbike class in 1984 when it released the original Ninja® 900. 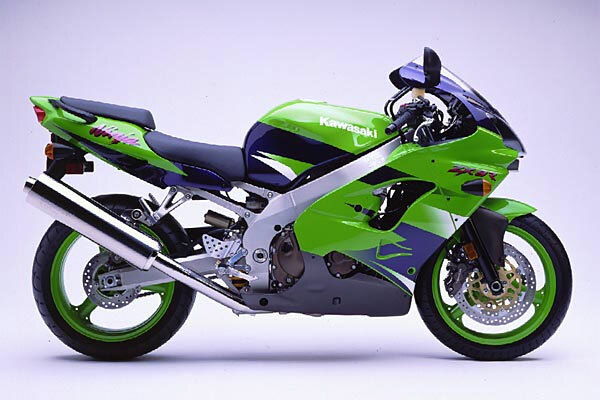 Since then Kawasaki has continually updated its Open-class Ninja motorcycle, and the 2001 ZX-9R features an engine that produces an abundance of heart-pumping power and strong acceleration in a lightweight, compact chassis for the ultimate sportbike experience. 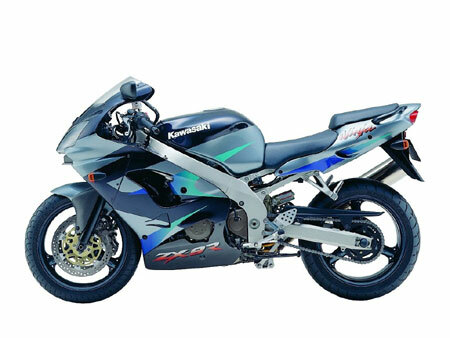 The ZX-9R engine has a lightweight, all-aluminum cylinder block. Each oversquare cylinder bore has an electroplated lining that resists wear and improves heat dispersion. The cylinder head is shaped to provide a high compression ratio, while cam timing and the cam profile are designed for plenty of torque across the rev range. Four Keihin 40mm downdraft carburetors deliver excellent throttle response and are equipped with the Kawasaki Throttle Responsive Ignition Control (K-TRIC) system. Linked to the ignition system, K-TRIC adjusts ignition timing for all throttle settings. A 16-bit microprocessor accurately adjusts timing from sensors at both the carburetors and the crankshaft. The carburetors breathe through Kawasaki’s Ram Air system that has a large intake duct for maximum intake efficiency. A right-side cam drive allows an extremely tight angle for the direct-actuation valves to further enhance intake efficiency. The four-into-two-into-one exhaust system features a lightweight, all-titanium muffler with the Kawasaki Clean Air System catalyzer, except for California models that have a stainless steel unit and an additional catalyzer for reduced emissions. The catalyzer allows the engine to be tuned for maximum performance since the catalyzer reduces emissions downstream. The short-wheelbase aluminum frame has wide spars and a long steering head pipe for rigidity and remarkable handling. An aluminum sub-frame is detachable for easy access to the rear suspension. The extruded aluminum swingarm features a hexagonal structure with ribbing for reduced weight and exceptional rigidity. Kawasaki’s Bottom Link UNI-TRAK® system has linkage ratios that provide a linear progression of damping and spring rates on the fully-adjustable single shock as the suspension is compressed. A ride height adjuster allows riders to fine-tune the chassis to suit specific conditions. Up front the 46mm cartridge fork has damping settings to match the stiff chassis and rear suspension settings. Dual front disc brakes have large-diameter 310mm semi-floating discs clamped by opposed six-piston calipers, while the rear brake holder is designed to save weight. The rear wheel has a six-inch wide rim that allows a wide rear tire for better traction, while both front and rear axles have a large diameter and are hollow for increased rigidity and light weight. The ZX-9R slips through the wind with its fairing that incorporates race-proven aerodynamics. Dual “cat eye” multi-reflector headlights enhance the ZX-9R’s aggressive styling. Below the windscreen is a compact electronic speedometer/odometer with LCD display driven by sensors located on the countershaft sprocket. 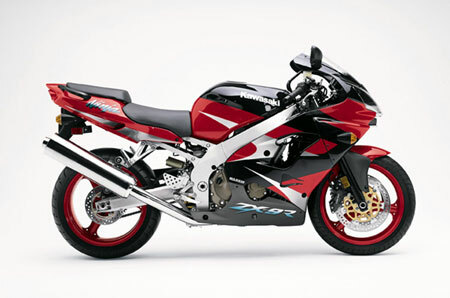 The original Ninja 900 established the standard by which sportbikes of the 20th century were judged. With its advanced features and performance, the 2001 Ninja ZX-9R ensures that the new standard for the 21st century bears the Kawasaki name. For years Kawasaki NINJA® motorcycles have defined the sportbike market and represented the company’s long-standing performance heritage. 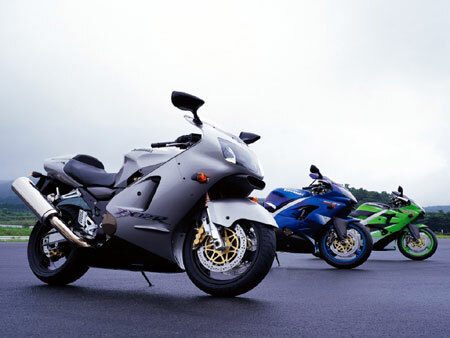 The 2001 Kawasaki NINJA motorcycle line-up gives motorcyclists a variety of ways to experience Kawasaki’s legendary performance, from the most powerful NINJA ever to entry-level models that can still deliver plenty of thrills to seasoned veterans. The NINJA ZX-12R is the flagship model in the NINJA motorcycle line-up and is the most radical embodiment of race-proven technology that Kawasaki has ever produced. 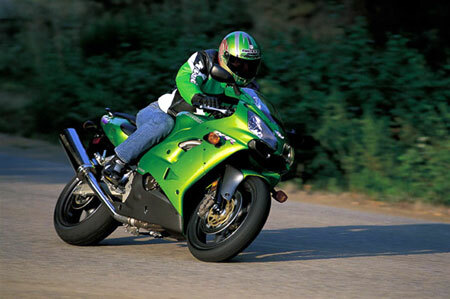 Quite simply, the ZX-12R was built to deliver the lightest weight and highest power-to-weight ratio of any machine in its class. The very first NINJA was a 900cc machine, and the ZX-9R carries on the tradition of providing open-class power in a lightweight, nimble package. This is the model that became the first production motorcycle to break the nine-second barrier in the enthusiast magazines’ quarter-mile testing. In recent years Kawasaki has dominated the AMA/Prostar Motorcycle Drag Racing Series, with Kawasaki Drag Racing’s Rickey Gadson winning three consecutive AMA/Prostar 750 Superbike National Championships, and teammate Marty Ladwig winning the 1999 600cc SuperSport title. near the top of the 2000 600cc SuperSport Series all season long. The ZX-6R has also been highly acclaimed in the enthusiast press, winning several 2000-model 600cc sportbike comparisons and being chosen “Best Middleweight Streetbike” in Cycle World magazine’s annual Ten Best Bikes feature. For those looking for NINJA performance at an economical price, Kawasaki has three models. The NINJA ZX-6 features SuperSport championship-winning performance in an extremely comfortable and user-friendly package, while the NINJA 500R and 250R models provide excellent entries to the NINJA motorcycle fold. No matter which NINJA motorcycle it is, customers can always count on getting a motorcycle that performs.